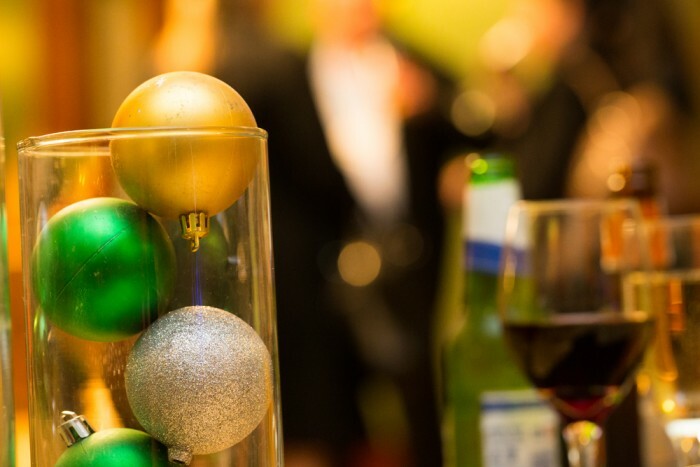 While December creeps closer and closer to the edge of our sights, it can be confusing – and often overwhelming – to dive into the depths of Christmas party planning. 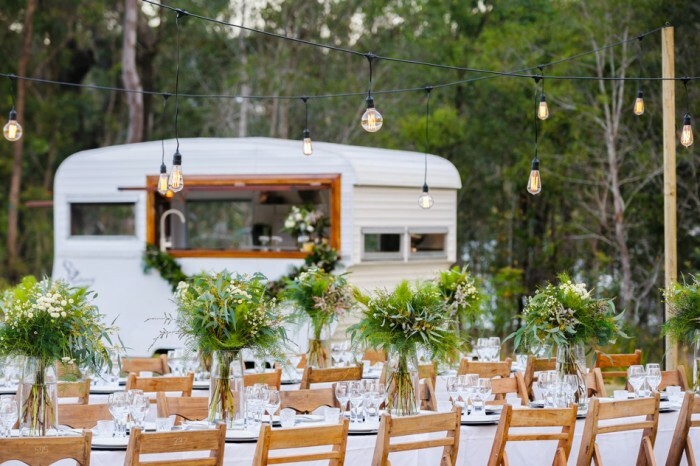 There may seem to be an unending list of menus, decorations and function venues in Brisbane, and tying these components together into a cohesive party plan can often be a headache unless you have a little help. Together with Brendan Cummings Director of Brisbane’s The Styled Group, Styled Events & Amini Concepts, we have developed a style guide to make planning your 2018 Christmas party as easy as 1, 2, 3. 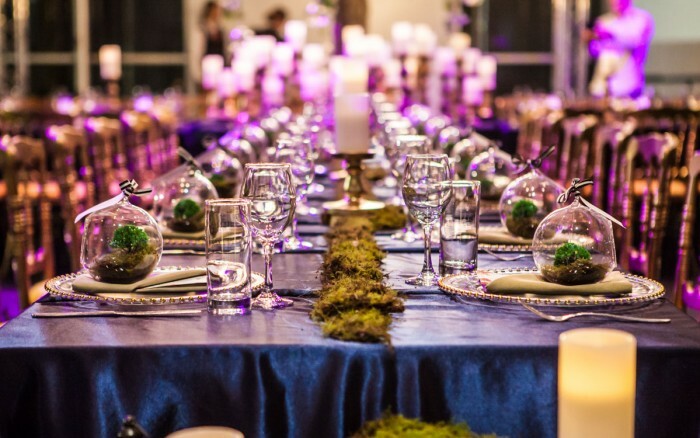 With sections of the style guide dedicated to three party categories – traditional, rustic, and unusual – there are a diverse range of unique options available for your yuletide event. 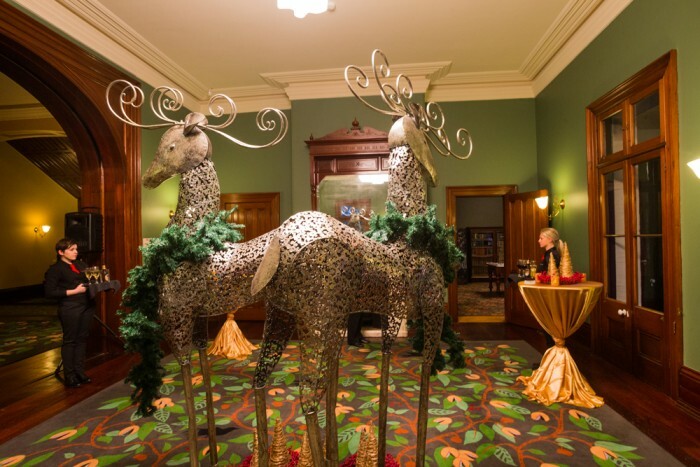 A venue well suited for traditional Christmas events is Brisbane’s Old Government House. 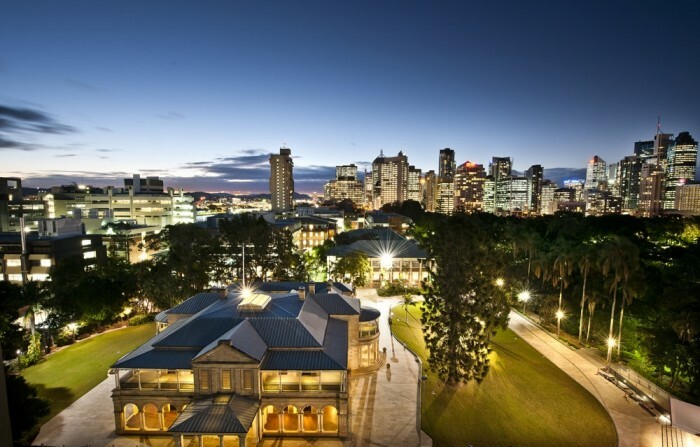 Set within the QUT Precincts, this heritage venue breathes old world elegance and style. Bolster your classic theme with Old Government House’s crystal chandelier and sweeping staircase. 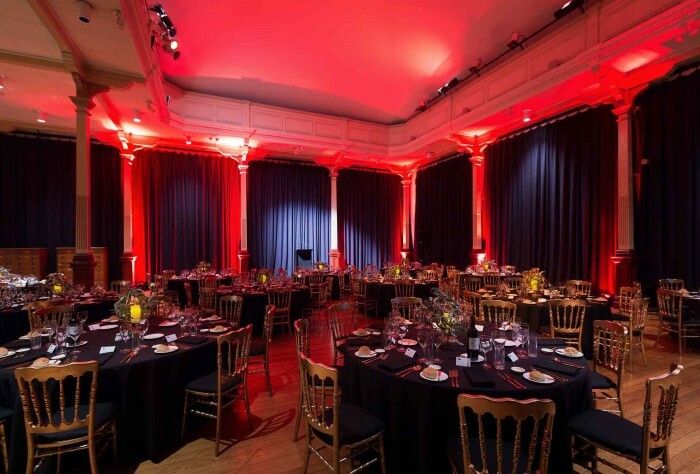 In coordination to your traditional Christmas party, Cuisine on Cue can treat guests to classical and elegant three course meals. With dishes like roast pork belly stuffed with apple, crispy skinned chicken breast with a leek, potato, pea and feta smash, and indulgent desserts of chocolate and walnut fondants and baked lemon and mascarpone tarts, the sumptuous flavours are a throwback to home-style Christmas dinners with the family. 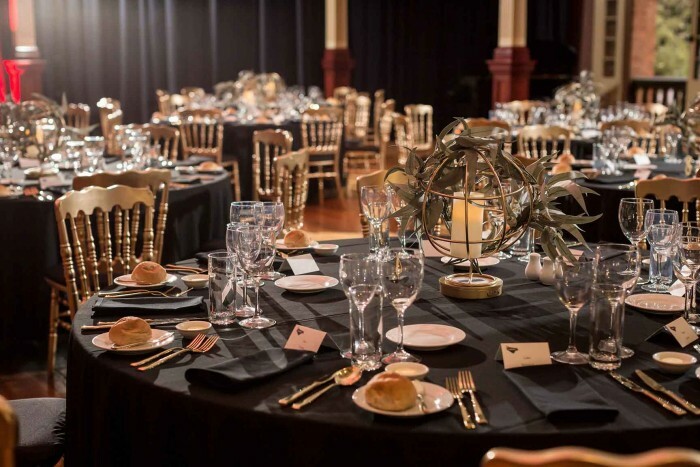 The Old Museum is one of Brisbane’s most historic function spaces, with a stylish and elegant touch of the past adding another layer to hosted events. 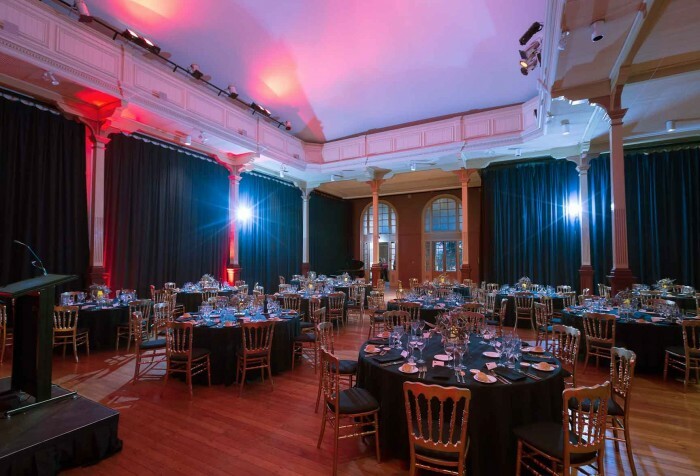 Stunning gardens and greenery make a marquee Christmas party at the Old Museum an ideal traditional setting. 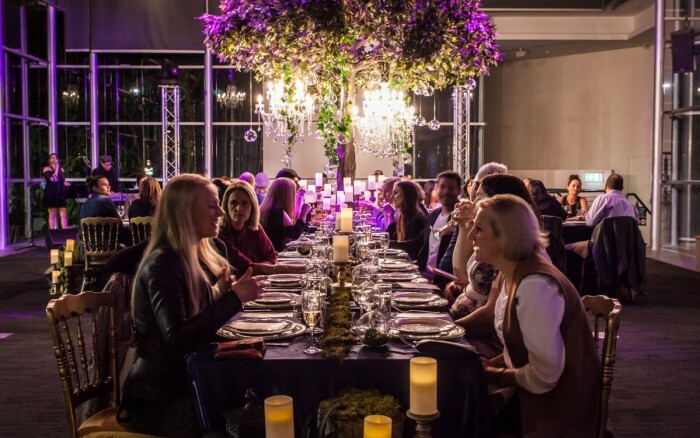 Consider dining under the stars with a garden marquee at the Old Museum. Cuisine on Cue have a range of classic share plates available to cater. 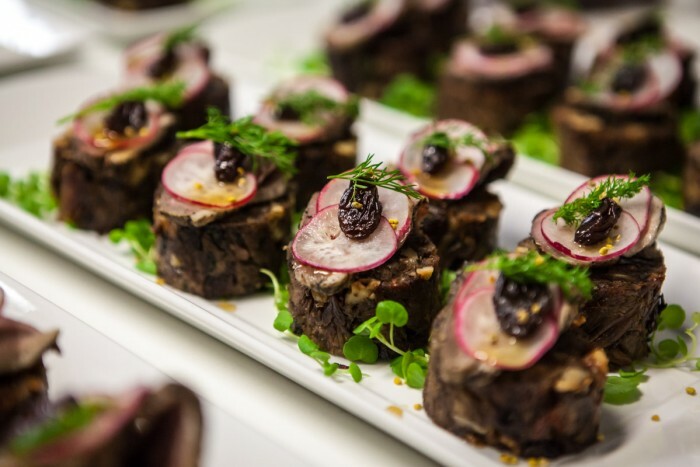 Adding a vibrant social element to your event, guests can share dishes of whole roasted lamb racks, pan-fried snapper fillets with crisp speck, sautéed mushrooms with goat’s cheese, and roasted root vegetables with confit garlic and thyme. Alternatively, we can set up an interactive buffet for guests, with a range of traditional dishes to be chosen at their leisure. Along with fresh salads and sides, diners can choose from mains like cottage pie with slow cooked beef, bacon and mushroom carbonara bake, and barramundi and smoked salmon pie. 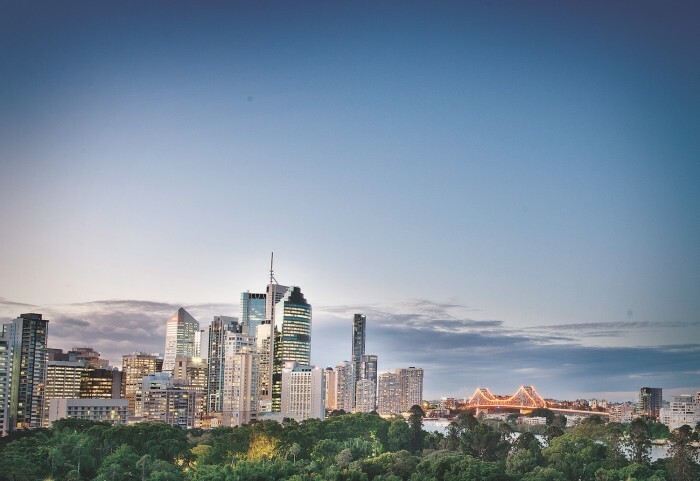 Sprawling views of Brisbane City and the stunning Botanic Gardens are set before guests at Room Three Sixty. Full-length windows act to welcome natural light and scenery into the sophisticated high-set room at QUT’s Gardens Point. 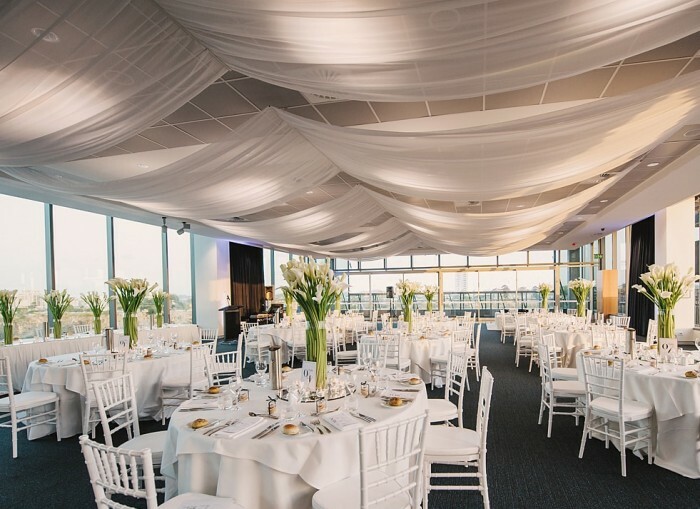 Guests are treated to stunning scenes of Brisbane’s skyline through the venue’s full-length windows, Room Three Sixty also offers two connecting terraces for outdoor glimpses of the Brisbane river and iconic Kangaroo Point cliffs. 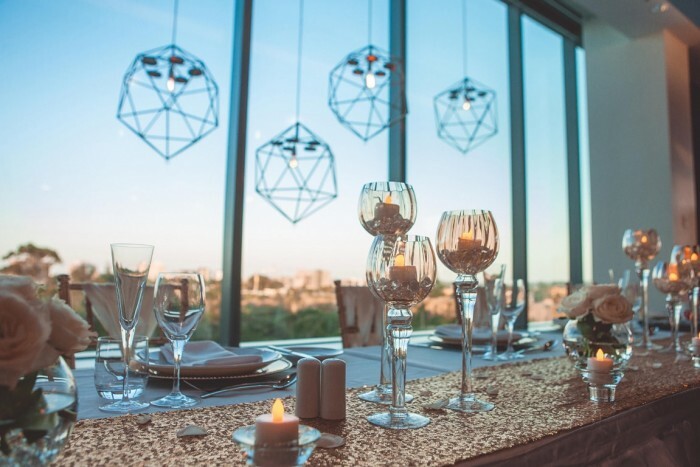 With its own in-house bar, guests to weddings and corporate functions may pair those glasses of wine with panoramic views on the terrace. 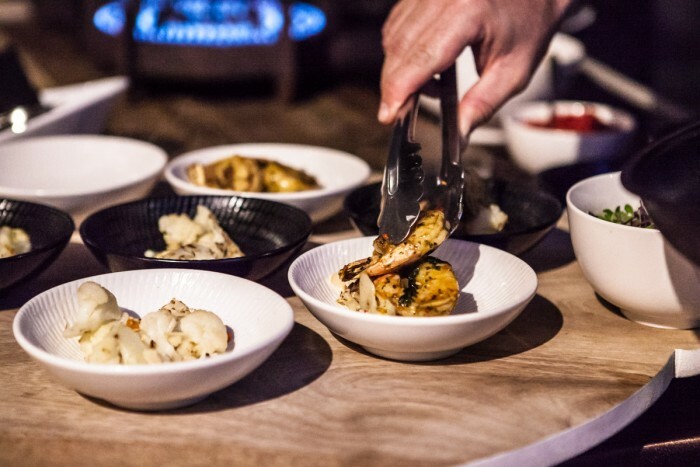 Pair your stand-up event with one of our styled canape menus, with classic canapes like freshly shucked oysters and shredded chicken on chipotle palmier, glasses of champagne, and macarons and tartlets for dessert. In addition to the above range of traditional Christmas catering, Cuisine on Cue will be hosting a special carvery menu where guests can dine on classic Christmas ham and fresh bread rolls. As the heart of many Australian Christmas celebrations, Cuisine on Cue will be providing a special seafood station with a fresh selection of baby octopus, prawns, salmon and oysters at the ready for your customary Christmas feast. 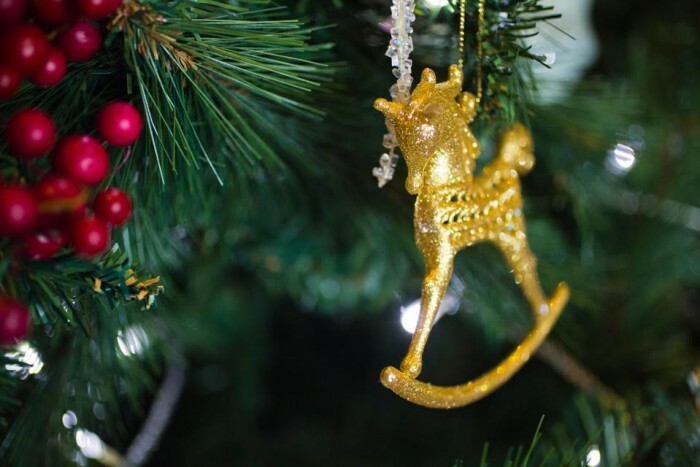 With dreams of childhood nights by the Christmas tree and family traditions long upheld, it’s easy to see the appeal behind a more classical Christmas party. 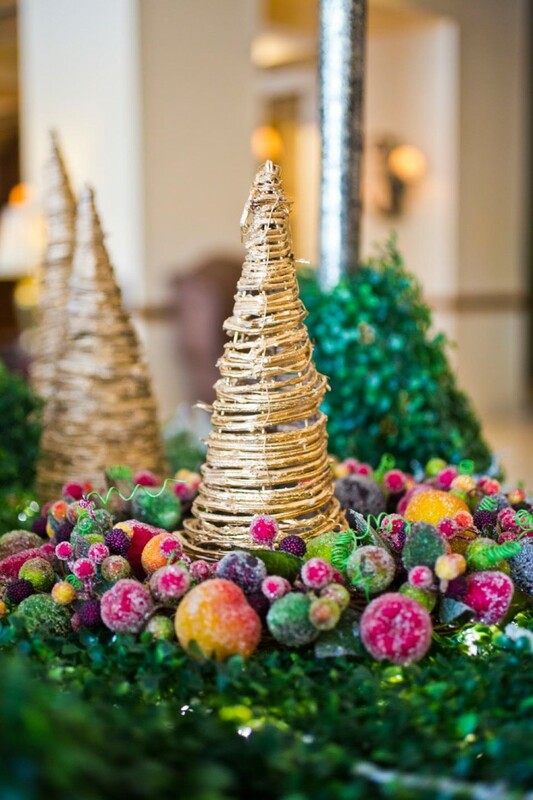 The team from The Styled Group & Amini Concepts recommend table centrepieces of reindeers, angels and Christmas trees among crystalized berry and fruit wreaths for parties with a warm, nostalgic theme. 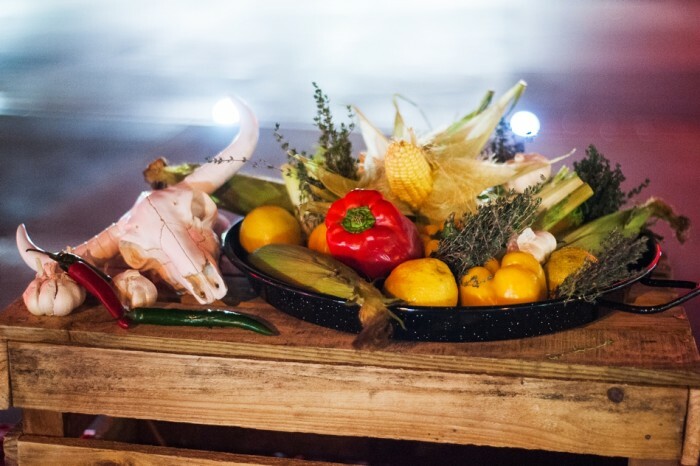 The natural, simple elements of a rustic party can be a welcome stylistic choice for an end-of-year event – particularly after the hustle and bustle of the work year. Brendan Cummings suggests imbibing your rustic Christmas party with earthy, warm tones and rich table fabrics. Additional aesthetics, like pine cones, natural candlelight, and scattered fairy lights can really add depth to your styling and craft an enchanting Christmas setting. 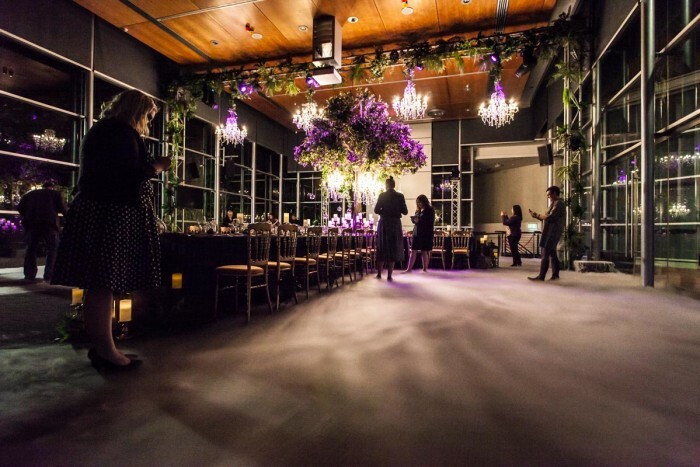 Take your back-to-basics event away from the city space entirely. Walkabout Creek is an outstanding rustic space situated in D’Aguilar National Park. Surrounded by invigorating greenery and local wildlife, it’s a stunning ‘getaway’ spot for guests to celebrate Christmas without any of the city stress. 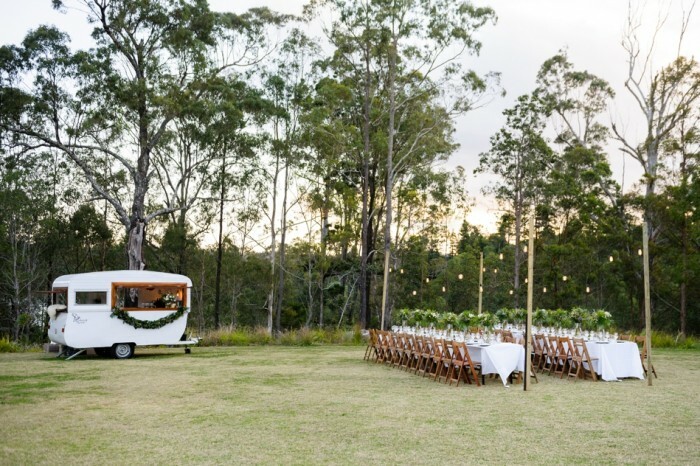 Featuring native wildlife, lush greenery and spectacular views, the Lakeside Lawn event space can host open-air Christmas parties and family day events for up to 250 guests. 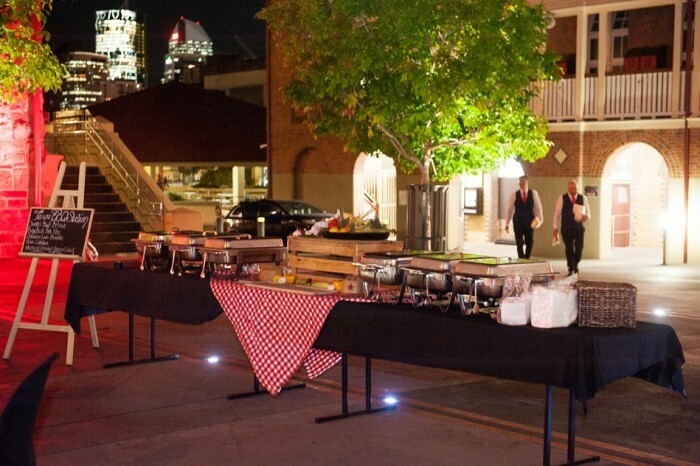 Walkabout Creek’s Lakeside Lawn is an adaptable and stunning space for your rustic Christmas party. 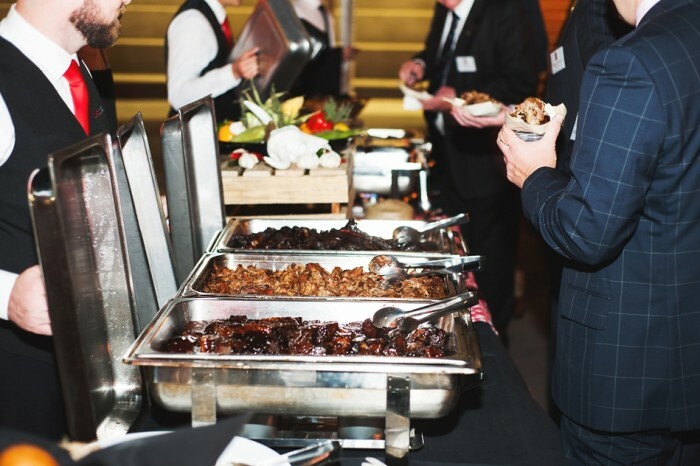 Cuisine on Cue offers a range of Red Boxes that would be well suited to your Walkabout Creek Christmas party. With boxes of scones, cheese plates and antipasto platters of salami, smoked salmon, olives, feta and lavosh wafers, it’s a simple and adaptable menu choice for rustic Christmas events. Want to add an unforgettable – and unmatchable – element to this year’s celebrations? 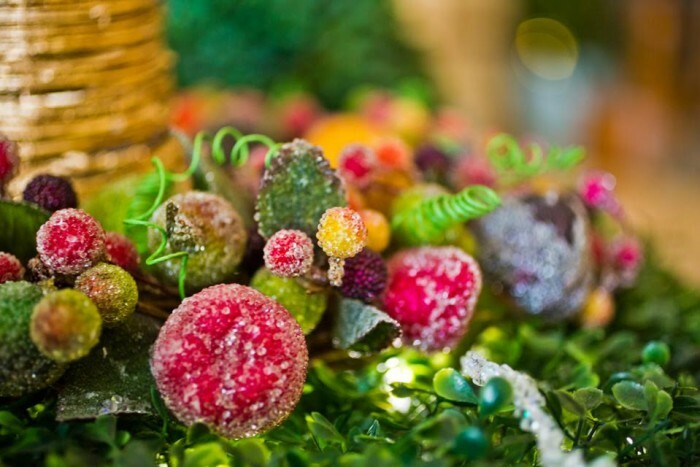 More and more parties are tending towards ‘out of the box’ theming options for their Christmas festivities. 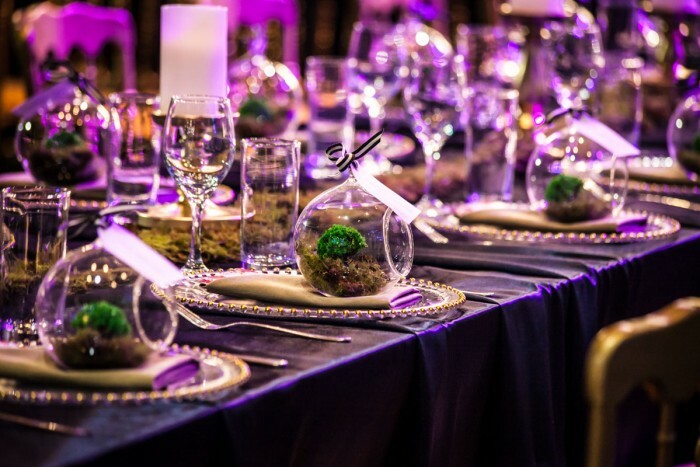 Brendan from The Styled Group endorses fresh, vibrant style elements like gold metallic aesthetics and twisted willow centrepieces with glass baubles. 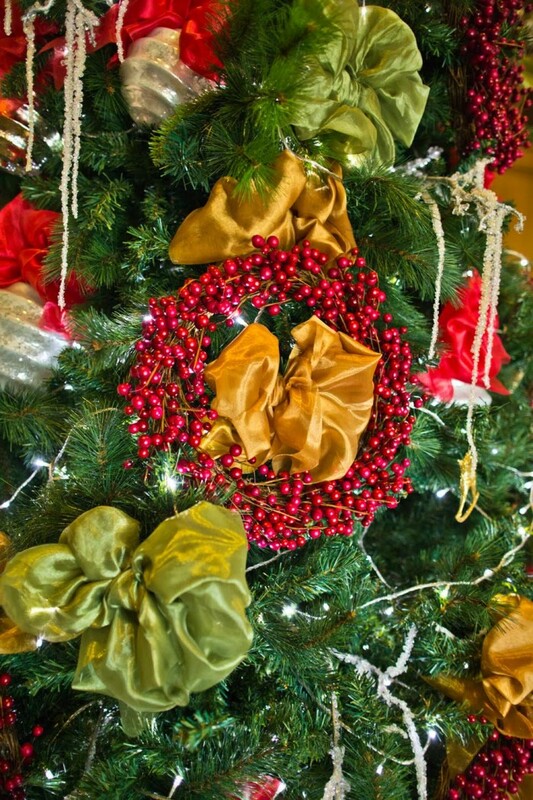 In place of the traditional Christmas tree, decorations could include styled glass hurricanes filled with natural candlelight, berry trimmings, and oversized pinecones. 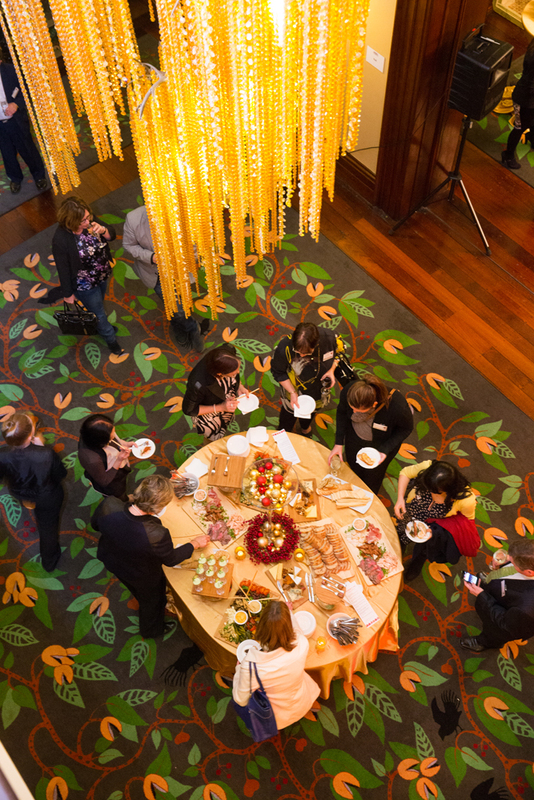 Red and gold lighting can be impactful in creating a strong, festive energy for your event. 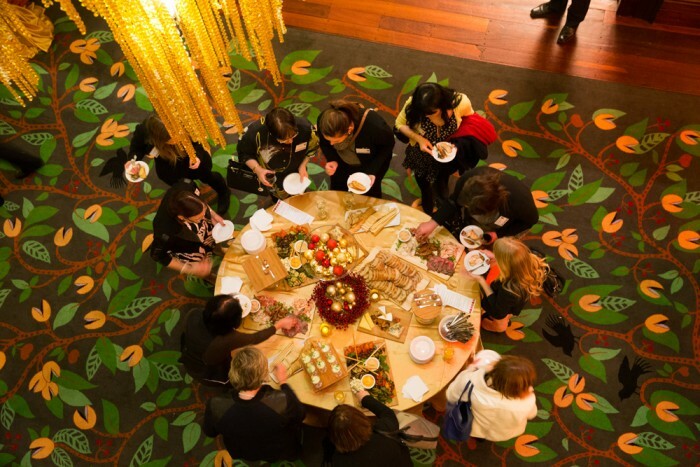 Additionally, the Gardens Theatre Foyer adds a very contemporary vibe to hosted events. 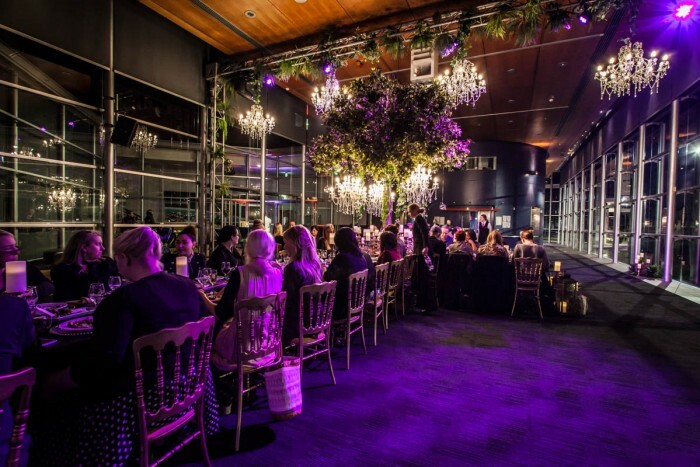 The glass walls and surrounding greenery from the Botanic Gardens act as a stylistic element in themselves, and the space is incredibly flexible for your chosen ‘unusual’ Christmas party. 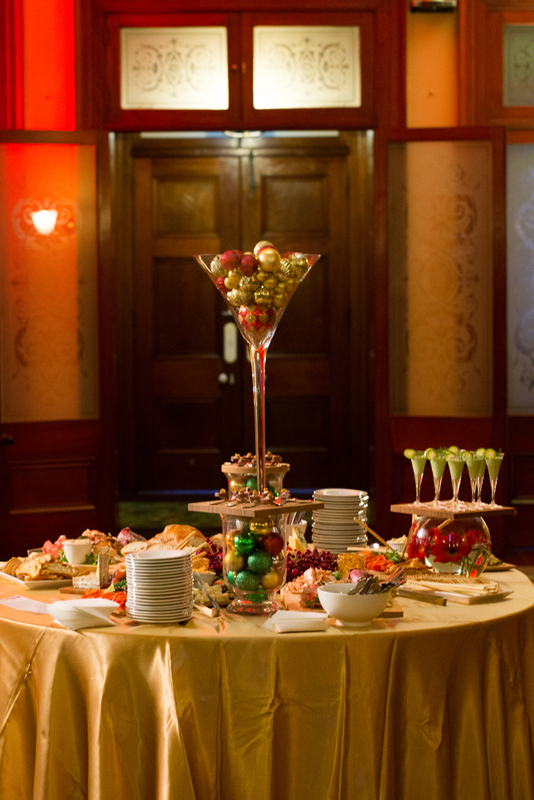 A unique party begs for a unique style of dining, and Cuisine on Cue is well-versed in alternative styles of serving their guests. 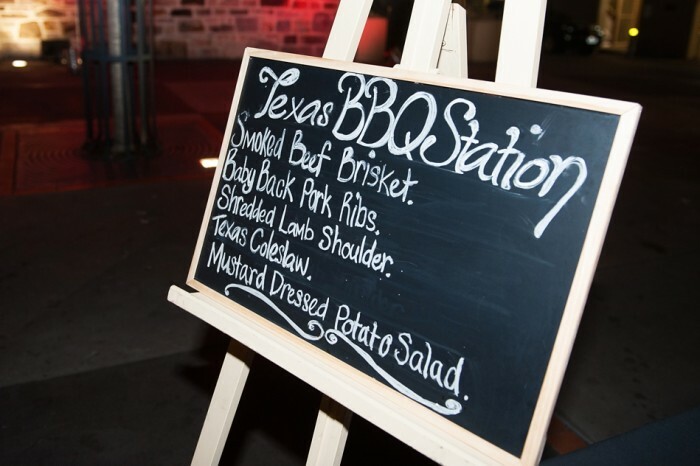 You might consider our specialty Texas BBQ Station – just one of our intriguing food station set-ups – to indulge guests in smoked beef brisket and Texas coleslaw served on brioche slider rolls. 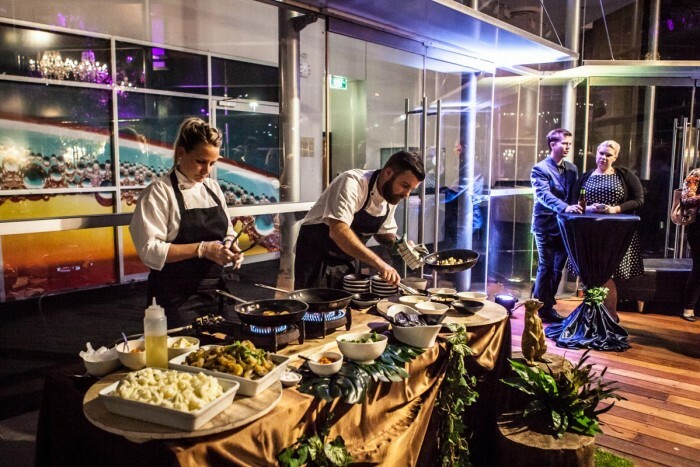 Our interactive and daring food stations are a lively addition to Christmas events, lending a buzzing social atmosphere to the celebrations. For more suggestions on the theming of your 2018 Christmas party, head to The Styled Group’s website or visit their Facebook page. 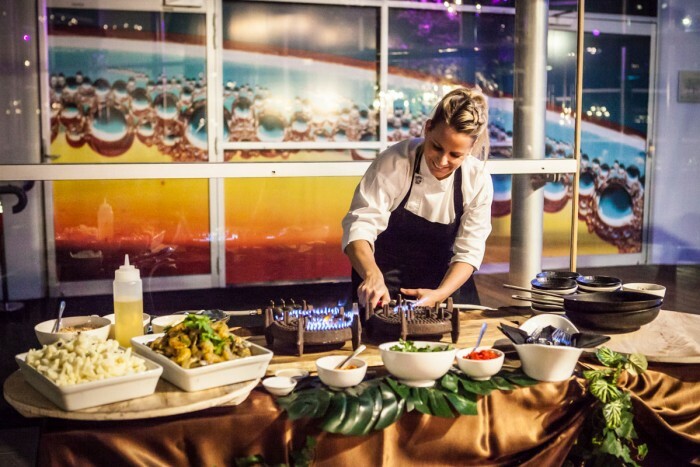 The Amini concepts team specialise in theming for corporate events. For more information, head to the Amini Concepts website or Facebook page. 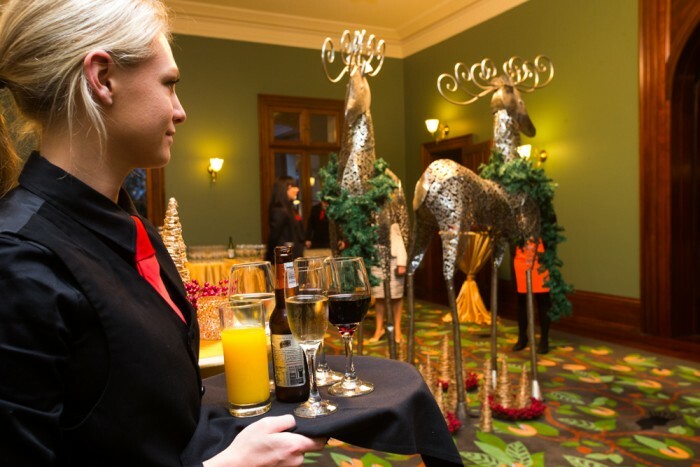 If you’re ready to start planning your Christmas party, contact us and a member of our team will be in touch with you shortly.